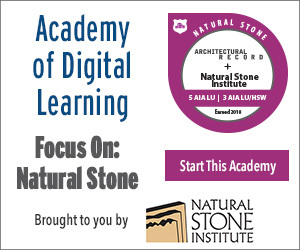 In conclusion, one of the most important takeaway messages for architects considering using natural stone exterior cladding is that they must work closely with the structural engineer for material and anchorage decisions, and they must include accredited specialists in the process from the very start of the project. There are many methods used for anchoring dimension stone, and the components for each vary. Moreover, the installation of the cladding is only one of the many elements of a complete wall system. Every component of the wall must be considered when deciding which anchorage system will be best for the project. For example, building professionals must first select a structurally viable building stone for their respective project before they even think about choosing an anchorage system. If for some reason test data for the stone isn’t current or reliable, they must plan to test the stone before selecting it. Once this is done, they can determine the panel size and thickness that best complements the physical characteristics of the stone. Only after these tasks are complete should they choose an anchoring system that is prescriptively designed by the architect or contractor, or the architect can specify a proprietary panelized system. If the architect specifies a system, they must shoulder the risk and responsibility of the choice. A good team that includes a structural engineer and a stone installer is critical for the success of the project. 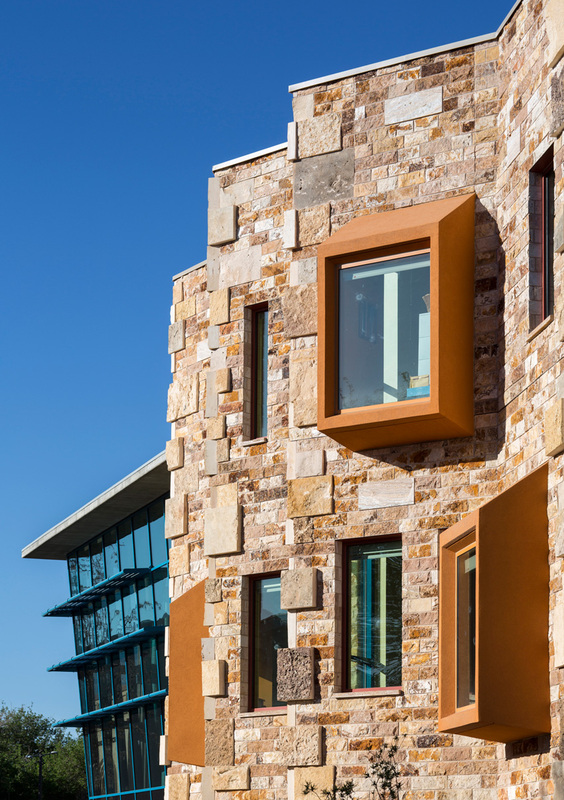 Natural stone cladding can help a building blend into the local environment when native stone is used. Here, New Mexico travertine and limestone are used to match local geography around the Associated Students of New Mexico State University Center for the Arts. Natural stone comes in many varieties, and it is important to understand the characteristics and qualities of each type used in construction today. Granite can be found in hundreds of colors, and it is one of the hardest natural stones. This combination of color and durability makes it an ideal material for everything from monuments, curbing, and building facing to fireplaces and countertops. Limestone’s uniform texture and grade make it a widely accepted dimension stone, in part because it can be easily cut, carved, and shaped into almost any design. Moreover, its homogenous nature and natural tendency to look better as it ages makes it a great choice for projects that may eventually be expanded. As with limestone, marble is a highly versatile stone that can be used for both interior and exterior projects. It can easily be shaped and sculpted, and it holds its beauty for a very long time. Marble is not as hard as granite, but it is hard enough to be used for flooring, countertops, backsplashes, and shower areas. Sandstone is a softer, user-friendly stone that has become popular as a wall cladding material and for flooring. As its name suggests, sandstone is made of sand-sized clasts, and while it can be a variety of colors, it is most commonly available in tones ranging from white and gray to tan and brown. Slate has a long history of use in construction projects because of its strength and density, which makes it a great choice for exterior cladding and roofing. Slate is frequently used for interior projects such as countertops, shower enclosures, and flooring. 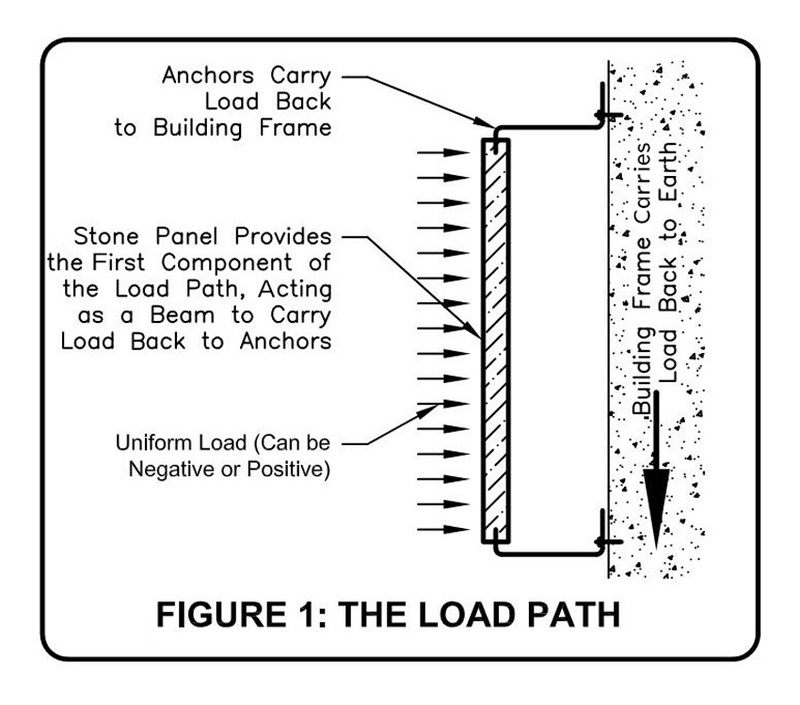 The load path on cladding systems is important to understand for successful anchorage system selection and installation, and three standards relevant to anchorage systems help ensure a safe and sustainable installation. ASTM C1201: Structural Performance of Exterior Dimension Stone Cladding Systems by Uniform Static Air Pressure: ASTM C2101 provides a standard procedure for determining structural performance under static air pressure difference and is generally used to represent the effects of wind loads on exterior building surface elements, specifically stone cladding. As noted earlier, wind loads can be difficult to gauge since the impact is affected by many different variables, such as the building surface, shape, height, surrounding terrain, and other buildings nearby. ASTM C1354: Strength of Individual Stone Anchorages in Dimension Stone: ASTM C1354 is used to inform design decisions concerning the type of anchor used to support a stone panel. The strength of a limited length anchor may be related to a longer length of support when the flexibility of the support is properly considered by the designer. This method provides procedures for determining the ultimate strength of an assembly consisting of stone with mechanical anchor. Load is applied in the direction of the loads anticipated on the building. The test is intended to represent the interaction of the anchor with the stone panel; however, the test does not include the influence of the backup structure on the strength of the assemblies. ASTM C1242: Standard Guide for Selection, Design, and Installation of Exterior Dimension Stone Anchoring Systems: ASTM C1242 provides an industry standard for engineering design considerations, documentation, material considerations, anchor type applications, and installation workmanship to assist designers and installers with achieving a proper and durable stone cladding. The standard outlines the anchor categories and anchoring systems and discusses the design principles that must be considered in selecting anchors or systems that will resist gravity loads and applied loads. Natural dimension stone is considered a prime building material for many reasons, including the diversity of colors, patterns, and textures, as well as its unmatched durability. In addition to the aesthetic and durability attributes, natural stone such as granite, marble, limestone, sandstone, and slate all have characteristics that contribute toward LEED certification or LEED construction. For example, stone is a natural product, and in many cases it can be obtained relatively close to a building site, which can reduce carbon emissions from shipping a material over long distances. Sustainable quarrying practices can be put in place to help protect the local environment during extraction and to reclaim the site once extraction is complete. Other green attributes of natural stone stem from the material’s physical properties. For example, because it is not manufactured, stone poses no risk of chemical off-gassing. This characteristic makes it desirable for interior projects. Natural stone is useful for exterior projects such as cladding as well, in part because of its high thermal capacitance, which can help with a building’s energy efficiency requirements for green building certification. Stone’s durability and low maintenance provide green benefits for both interior and exterior projects. Durability translates to a long material lifespan; unlike some manufactured products, it doesn’t need to be replaced and should last the lifetime of the building. Not only is stone low maintenance, its aesthetic attributes often improve with age, and again do not require much in the way of treatment. In addition to the physical properties of the stone itself, new fabrication techniques have made it easier and faster to cut the stone in thinner and more precise slabs. These advances have developed in tandem with new anchoring systems, which have greatly reduced the installation time and difficulty of stone cladding, and which have also improved the safety, security, and durability of the cladding once it has been installed on the building exterior. Natural dimension stone is most often quarried rather than mined since it lies close to the surface and thus is moderately easy to extract. Modern quarrying technologies and practices are much more precise and efficient than they used to be. For example, diamond wires and saws can cut stone to exact dimensions with very little waste. And the practice of using whatever is produced, whether it is dust or aggregate, for the production of materials such as plaster, cement, or fertilizer adds to the overall sustainable nature of the practice. Moreover, responsible, sustainable stone companies will ensure that the quarry site is eventually reclaimed for other purposes, such as wildlife habitats, recreation areas, or parklands. Once natural stone has been extracted from the quarry, it is cut and finished according to whatever specifications are required. In the case of natural dimensional stone for exterior cladding, the individual stone slabs will be cut to a designated thickness and finished in any number of ways, whether blasted and shaped with water, polished and buffed, or sandblasted. Exterior cladding is often prepared using a split-face technique, where the stone is split either by hand or with a machine to reveal its natural texture. This technique enables a flat back, which can be easily anchored to the building structure and an uneven, “natural” front surface.